The two north aisle windows have been renewed, and one on the south aisle is soon to be installed and dedicated to the memory of Captain Robert Nairac. The Gurney memorial will therefore be the remaining window on the south aisle. All four windows will be in similar style, principally plain glass with a striking blue border with inset heraldic emblems and text. The heraldic devices to be incorporated into the Gurney window will be those of Gloucester Cathedral, the Royal College of Music, the Royal College of Organists, and the Gloucestershire Regiment. The dedication will read, �Dedicated to the memory of Ivor Gurney � 1890-1937 � Composer. Poet of the Severn and the Somme.� The estimated cost of the window is £5000. Dorothy Gurney, writing to Marion Scott shortly after Ivor�s funeral, doubted whether the stone would last five years. The lettering was re-cut in 1990 for the Centenary and is now much worn. As most members will recall, the stone had to be repaired in 1998 after it was broken. The Committee have approved the shape and lettering for a new memorial, in Hopton Wood stone, to a design by Diana Lee-Browne. The estimated cost of the stone is £500. 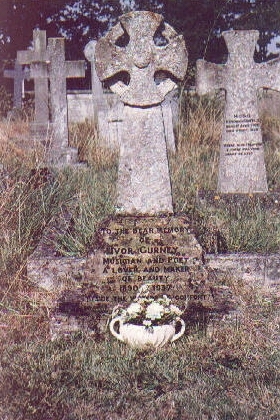 Ivor Gurney�s grave at Twigworth. As a corollary to this John O�Brien has outlined plans for a permanent Ivor Gurney Exhibition and Study Centre in Twigworth Church � where the original Celtic cross would be displayed � and the Committee agreed to support the Church in seeking funding to achieve this. Since its formation in August 1995 the Society has achieved much in bringing the life and work of Ivor Gurney to a wider public through publications, recitals and a variety of other activities. (An excellent summary of this successful work is contained in Anthony Boden�s �Society Notes� on pages 85-87 of the 1999 Journal.) We have done all this largely using subscription income without having to appeal to members for additional funding � until now. The cost of the memorial window is more than existing Society finances can cope with. A public appeal for funds will soon be made throughout Gloucestershire but, in the meantime, the Society looks to members� generosity to respond warmly to this appeal. Any persons interested in making a donation towards the Gurney Window and Gurney Gravestone are asked to make cheques payable to the Ivor Gurney Society, 7 Carlsgate / Hay-on-Wye / Hereford HR3 5BS / England. Gloucester-born poet and composer Ivor Gurney has been remembered with a stained glass window at a city church. The Ivor Gurney window at St. Mary de Lode church, in St. Mary's Square, was dedicated by the Dean of Gloucester, the Very Reverend Nicholas Bury, in a special service on Saturday. The window was sponsored by the Ivor Gurney Society and society patron Ian Partridge sang the Gurney song Severn Meadows during the service. Society chairman Anthony Boden read three of Gurney's poems and spoke of Gurney's love for the city of his birth. "He was undoubtedly a poet and composer of national and international importance, but even so he knew absolutely that he belonged to and was possessed by Gloucestershire," Mr Boden said. "It was the source of his inspiration and at the heart of Gloucestershire and his inspiration was this city." dedication of the Gurney window. The window, Mr Boden said, is a biography in glass. It includes the heraldic coat of the diocese of Gloucester, the coat of arms of the Royal College of Music, the arms of the Royal College of Organists, and the badge of the Gloucestershire Regiment in which Gurney served. The window was designed by Bristol-based stained glass artist Roy Coomber. The Reverend John Marshall, Rector of St. Mary de Lode, said: "It is a great delight for us to be able to provide space for this window." The Ivor Gurney Society has also bought a new memorial stone for Gurney's grave in the churchyard of St Matthew's Church, at Twigworth. The original stone, which is worn and damaged, is being moved inside the church as the centrepiece of a planned permanent Gurney exhibition there. The new stone was sculpted by Diana Lee-Browne, from Fairford, and was dedicated by the Rector of Twigworth, the Reverend John O'Brien. The inscription reads: Ivor Gurney, Composer, Poet of the Severn and Somme, 1890 � 1937. Commenting on the new memorial, the Rector of Twigworth Rev John O'Brien said: "The original memorial to Ivor Gurney has suffered over the years. I'm very pleased that members of the Gurney Society took the initiative to get the new memorial made. It's a striking piece of work, and is a fitting tribute to someone whose work is gaining more and more international recognition by the year." The Ivor Gurney Society has donated £4,000 to the total £5,500 cost of both projects and is hoping to raise the remainder through donations from the public. Anyone wishing to make a donation should send it to Anthony Boden at Chosen Hay, The Green, Churchdown, Gloucester, GL3 2LF. Looking for more ways you can help Ivor Gurney? Go to Participate in Gurney's World !